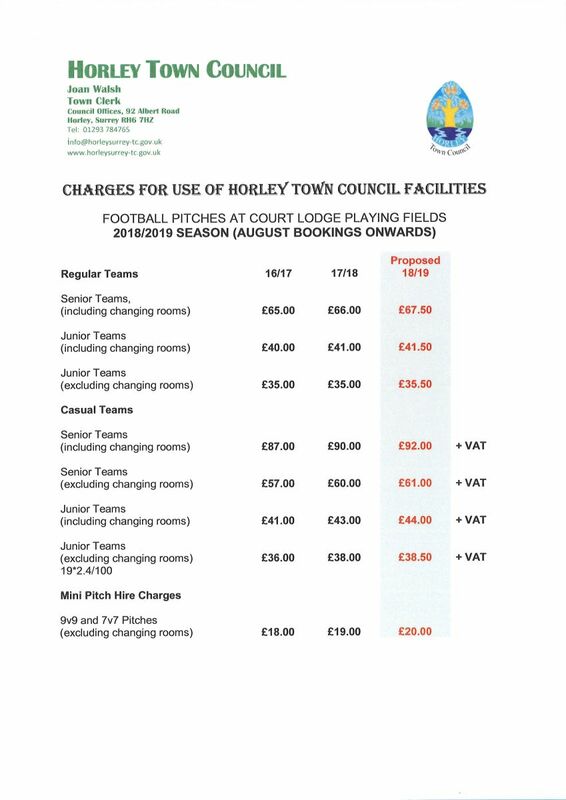 lf you are a local Football Club interested in playing regular adult or junior league fixtures at Court Lodge Playing Fields, Thornton Close, Horley, on Saturdays and/or Sundays, please contact the Town Council for information and to apply for a Football Booking Contract. Any enforced cancellations due to inclement weather or unsuitable pitch conditions will be sent via Text Alerts to all Team Managers by midday of Fridays, preceding weekend matches. A wireless CCTV system at Court Lodge Playground and extra surveillance cameras around the Innes Pavilion has effectively maintained crime prevention at the site. The Town Council continues to work closely with a local security company and crime reduction officers to monitor any breaches of public order as well as unauthorised use of the pitches and associated facilities. At Court Lodge Playing Fields, there are five football pitches. The football pitches are hired to local league teams on a regular weekly basis, but they are also available to book on a casual basis. Male and female changing facilities at the Innes Pavilion are provided. All pitches are subject to availability at the time of booking and MUST be paid for in advance of the fixture being played. For further information on regular or casual hire together with pitch charges, please contact the Town Council office direct.